I love my Biscuits and Juice! 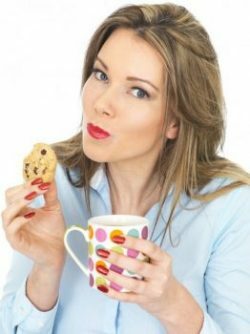 You may love to eat a cream biscuit with your cuppa each day. You may love to drink fruit juice because you believe it is good for you. Believe it or not the cream biscuit has 3 teaspoons of sugar in it! The fruit juice can have anywhere from 3-5 teaspoons per serves. Eating an apple gives you 3 teaspoons of natural sugar mixed with fibre which is a slow release of energy. Which one do you think is better for you? I say there is nothing like getting back to God’s garden to eat correctly to fuel your body. You most probably know the apple is the better choice but why do you go for the biscuit or juice? Often the business of life, rushing from here to there, you want to eat something quickly. It is convenient to grab and eat the biscuit or drink the juice. Exploding with energy to continue with your day, not realising that the biscuit or juice gives you a spike in energy for a short time only and then the roller coaster of another sugar fix is required later. Your time is precious and the convenience of quick and easy is taking you on this road. Believing you are fueling for your body to keep going, to get everything completed during the day. But what is the biscuit or juice doing to your body? Here is what happens to your body when you eat food. Te food become glucose which gives you energy and life. Different type of food eaten will depend on the rate of glucose absorption into the body, affecting blood sugar, the liver and general health. In the above case of the cream biscuit/fruit juice compared to the apple, the cream biscuit/fruit juice is absorbed quickly into the body and gives you energy which is a much higher sugar content that your body has to process. While eating an apple you are more likely to sit and to chew your food, this helps you relax and absorb your nutrients and the sugar content mixed with the fibre content giving you energy which sustains you evenly throughout the day creating a balance of energy and moods. How much and how often you eat these foods which make the difference to the waistline and health. Which would you prefer – the roller coaster or the sustained energy lifestyle?